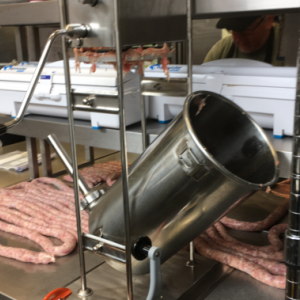 The end to end sausage making process has a number of exciting and fun steps which have been detailed below. There are some slight variations depending on the flavor that is being produced. I have chosen to omit the drinking of red wine whilst the production of Leek and Stilton was being completed - even sausage making has trade secrets! The sausage cannon is Team Sausage's primary weapon of choice. Once expertly blended, the sausage mix is loaded in to the chamber and the cannon closed. With the might of Big Chris at the handle flexing his forearms like a fiddler crab on steroids, the mix is forced through the cannon and into the all natural British Hog casings. We source out meat from local butchers where the pork is free range, outdoor reared and supplied by local farms so we can guarantee the best welfare for the pigs. The meat and the fat are expertly minced and supplied to us separately so we are able to strictly control the fat content of our sausages to maintain our premium flavor and quality. We pride ourselves on keeping the fat content below 10% in all our product, almost as healthy as a freshly unearthed carrot. All flavors start with our secret blend of herbs, spices and natural flavorings gathered from around the glode and blended together. Yeastless Rusk is also added to the mix. The Rusk is simply unleavened bread that has been baked and dried before being ground into a fine crumb. Breadcrumbs could also be used but using Rusk gives a good and consistent texture to the sausage, it also retains the moisture within the sausage better than breadcrumbs giving you a more succulent sausage, and finally because it is yeastless it gives the sausage a longer shelf-life. The mixture is then enhanced to create or improve the final flavor. Pork & Mustard receives a blend of English, French and Dijon mustard, Leek & Stilton gets a block of local fresh stilton crumbled in and Pork & Black Pudding gets the finest black pudding added to the mix. With the delicate hands of a pianist David skillfully guides the sausage from the cannon and on to the preparation tables in order to move through to the next phase. Speed and dexterity are essential to achieve an even sausage and matching Big Chris on the down stroke is an art in itself. Experts at twisting, Andy and Glyn share the task of transforming one single long sausage in to the shape we all know and love, the household banger. The process begins with right good gossip about current affairs, global investment strategies, the state of the commonwealth, what was watched on TV last night and what is going in in Mortimer. Next, the sausage has started to flow and with a deft flick of the wrist the sausages start to take shape. Link after link are produced and transferred to refrigeration to age overnight. After a long hard session on the table Andy will often relax his weary wrists with a nice cup of Lady Gray. The final step it to package up the sausages under the well known Black Pig branding. Jacko ensures that packs are correctly labeled both back and front with ingredients, storage and flavor details and stacked ready for final delivery.